WASHINGTON (Reuters) - Despite signs that Democrats are in a strong position, U.S. President Donald Trump vowed on Tuesday to beat expectations and keep the House of Representatives in Republican control in the mid-term elections in November. 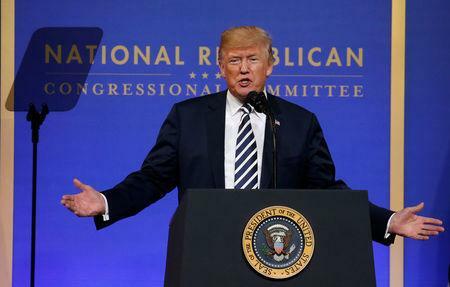 Trump, who won an improbable victory in 2016 as an outsider, spoke at a National Republican Congressional Committee dinner in Washington that raised a record $32 million for Republican House candidates. "We're going to defy predictions once again. We will keep the House majority," said Trump. Whether the party can make good on Trump's prediction is far from clear as Republicans face headwinds holding onto control the House. Democrats, riding a wave of angst about Trump's presidency, hold an enthusiasm edge in public opinion polls. The party that wins control of the White House typically loses seats in the first congressional mid-term election after a new president takes power. A Democratic win in a special election last week for a House seat was seen as a referendum on Trump's performance and an ominous sign for the November elections. Trump had won the congressional district by almost 20 percentage points in 2016. A loss of one or both houses of Congress would spell trouble for Trump's "America First" agenda by forcing him into greater compromises with Democrats. Trump said Republicans can beat the odds by embracing his policies. He said they should promote the tax cuts that he helped steer through Congress in December and embrace his tough immigration message. "A vote for Democrats is truly a vote for open borders, people pouring into our country," said Trump, who wants to build a wall along the U.S.-Mexico border and crack down on cities with lenient immigration policies like Los Angeles and San Francisco. He vowed to campaign "all across this country to elect Republicans" and urged party voters to guard against complacency.